In case you haven't noticed, most of my blog titles to this point are songs or lines from songs. Often while I am writing my sub-conscience will go to a song related to what I am writing about - so I take the easy way out and and borrow from the song in my head. I like the idea of using song titles or phrases for titles - it is easier than thinking up something clever, and it beats the heck out of MY BED which is really what this post is about. But when it comes to songs about beds you enter into some iffy territory - it you know what I mean.... I actually Googled songs about beds and didn't find much so I stuck with my favorite (and the one in my head anyway) song about beds from The Last Kiss soundtrack. The bed is made up of three sections: the door, a section of MDF covered with Anaglypta paper and crown molding. I just happened to have the perfect door in my hoarded door collection. It was just a little longer than a king size bed and had equally sized and spaced panels. The bottom section of the door was a little longer than the top so I cut off enough inches from the bottom to make the sections equal. I selected the crown (this one is "egg and dart") and the flat molding to complement each other. I bought enough to cover the face of the door and another 8 inches so it would wrap around the edges of the bed. The MDF insert for this headboard was cut to 12 inches tall - so the exposed area is actually 11 inches. I used two pieces of MDF sandwiched together to get the insert to match the thickness of the door. I then attached the MDF insert to the door with mending brackets. Mending brackets come in many sizes - this headboard is very heavy and I REALLY didn't want it falling apart on my head while I slept so I used several hefty mending brackets to ensure that this did not happen. I ordered the Anaglypta paper from a Benjamin Moore store. This paper is not cheap - so buy a pattern that you think you can use on other projects. It also comes in border sizes - if you are willing to have a smaller inset section. I attached it to the MDF section of the headboard with wallpaper paste with a little extra white glue around the edges. I wrapped the paper around the edges to the back and tacked it with a staple gun. I mounted the crown and flat molding over the wallpaper. 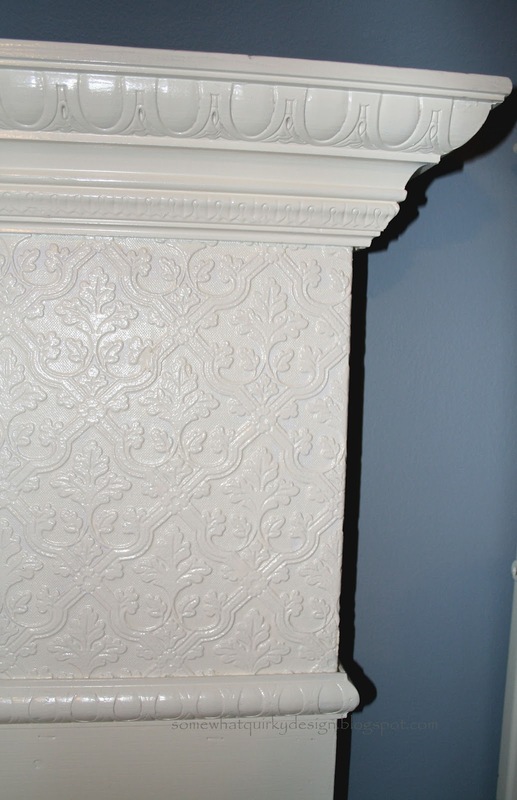 The Anaglypta paper is not flat so it is best to add a bead of caulk where the molding rests on the paper. I did not do this and I regret it. Then I primed and painted the monster. I used High Gloss Alkyd Impervo paint from Benjamin Moore. The color is Bavarian Cream. 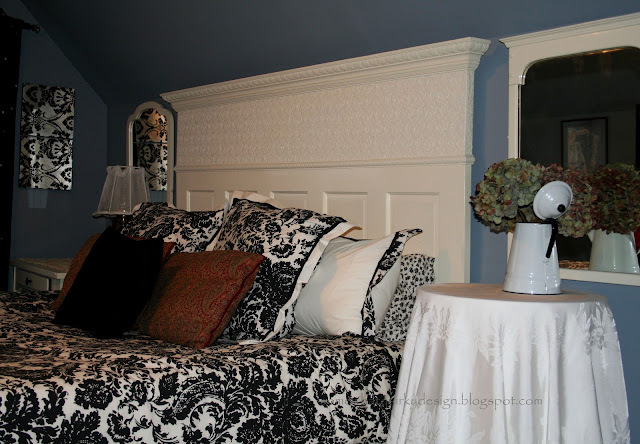 Presto Change-o a beautiful headboard was born! This headboard is mounted to the wall - how you do this depends on the area where you are hanging it. A cleat would probably work in most circumstances. I would NOT try to put this on legs and expect it to stand. I repeat - IT IS VERY HEAVY! The first time I made a headboard like this I painted it an olive green and glazed it with a barn red color. It was beautiful. I kind of like this one too though. NOTE: if you build a king size headboard in your basement it is wise to measure to make certain you can get the headboard OUT of the basement......I did not do this. Mr Quirky and I had to remove three basement steps to get this sucker out of our basement. These steps didn't get put back in place for at least a year. Wish like crazy that I had the whole debacle on video. This project is really way easy - the hardest part is managing the large heavy pieces. So if you have a helper available I advise you take advantage of their help! I think I might live with this headboard for a very long time. I love her. Wow - this is so pretty! I love the glossy white, and that was a perfect door! Note to self: Start assembling a stash of doors. Thanks Revi. Good luck with your whole home redo - I too am fascinated with the white room thing. However, when it comes to actually doing something I never pick white. I did recently paint my kitchen cabinets white which I love. Of course there will be a lot of black and other color to go with....I think I'm just a color girl at heart. Maybe I should have two houses to satisfy my split personality! I love your headboard, it turned out great. I wanted a similar paneled door look and didn't have doors or could find any that would fit our large bed. So my husband made it for me. So you are a door hoarder huh? That's one story line I really wish they would put on that tv show. I could watch it and then I think I would understand instead of just shake my head in disbelief! Well if Mr. Quirky was making me furniture like Brawn I wouldn't be in the basement making beds from doors that's for sure! I'm following you now. Being a newbie is challenging....Thanks for commenting. Thanks Jennifer for the kind remarks. You SHOULD make one! 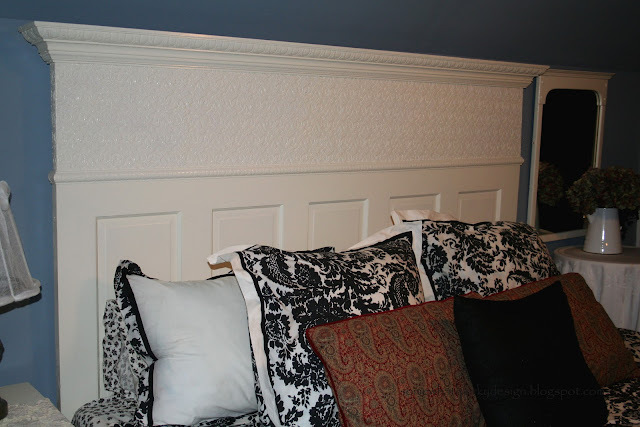 Your headboard is STUNNING! I love it! I'm a new follower and look forward to seeing some more awesome designs. Thank you Diane! I'm following you back! I think I bought that black and white vinyl (that you used in your drawers) to put in the back of my kitchen cabinets. I say "think" because it is still in the box - since it arrived 6 months ago. Thanks again!